A spoof of science fiction films and TV series, these are the adventures of Adam Quark, captain of a United Galactic Sanitation Patrol ship. His cohorts include Gene/Jean, a "transmute" with male and female characteristics; a Vegeton (a highly-evolved plant-man) named Ficus; and Andy the Android and Betty and Betty (who always argue over who's the clone of the other). Based at Space Station Perma One are Otto Palindrome and The Head. Though Quark is supposed to stick to his sanitization patrols, he and his crew often meet adventure with such colorful space denizens as the evil High Gorgon (head of the villainous Gorgons), Zoltar the Magnificent, and Zargon the Malevolent. Back after Star Wars became a smash in 1977, it prompted imitators like Battle Beyond the Stars and Battlestar Galactica. 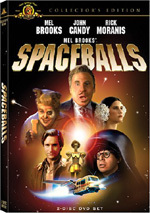 In addition to these more obvious rip-offs, it inspired a spoof: TV’s Quark. Created by comic legend Buck Henry, the series ran a mere eight episodes in 1977/1978. Or did Star Wars really inspire Quark? Based on the info I found on the Internet, it appears that the series’ “Pilot” aired a few weeks before Star Wars hit movie screens. However, after that early May 1977 airing, the show stayed on the shelves until February 1978. At that time, the series demonstrated a much more significant Star Wars bent. While this means the show didn’t originally launch due to Star Wars, it got a second wind due to the film. I vaguely remember Quark from its broadcast run, but like most folks, I’d not seen the show in 30 years. With the release of this “Complete Series” DVD, I decided it’d be fun to give it a look. The disc presents all eight shows in the order broadcast. The synopses come straight from the package’s insert. The “Pilot” bears a decent resemblance to classic Star Trek, which makes sense since it appears that it originally intended to spoof that seminal series. Quark himself boasts a really Captain Kirk feel, and the similarity in names can’t be a coincidence. Later episodes will show more of a Star Wars dynamic, but in the “Pilot”, Trek rules the day; from characters to sets and effects, we get a real Trek impression. Hopefully later episodes will also produce greater amusement. The “Pilot” prompts a couple of minor chuckles but that’s about it. Instead, we mostly focus on stale sci-fi conventions without much inspiration. Maybe it played better 30 years ago, but now it looks lame. Let’s hope for better comedy in the subsequent shows. Obvious Star Wars influences pop up here, as “The Source” and the Head Gorgon clearly take their cues from that flick. Other aspects of the episode also steal from Star Wars, such as when The Source instructs Quark to perform an exercise similar to Luke’s training. Then again, the episode introduces Ficus, a somber character clearly based on Spock, and the show’s framework still feels a lot like Trek. While it’s nice to see a broader sci-fi focus, the big question remains: is “Source” any funnier than the “Pilot”? Unfortunately, I don’t think so. Some of Quark’s bickering with the nagging Source creates amusement, but that’s about it. This double-length episode still suffers from a definite lack of hilarity. After three episodes, Quark finally shows signs of comedic life. The episode mixes some dry humor – such as Palindrome’s amusingly cryptic instructions – with good broader moments. Benjamin’s goofy take on Old Quark delivers well, and the show even boasts a pretty clever story. This is a pretty good episode that demonstrates the series’ potential. It’s starting to look more and more likely that Quark left behind its Star Wars aspirations with “Source”. “Old” bore an unmistakable Trek impression, and “Ficus” definitely continues that trend. It obviously borrows from “Mirror, Mirror”, though it doesn’t act as a straight copy. It produces some fun moments and turns into a pretty good Trek spoof, especially when we see the cast’s relentless overacting as the “bad crew”. As “Ficus” directly reflected “Mirror, Mirror”, “Polumbus” bears a striking resemblance to Trek’s “Shore Leave”. However, “Polumbus” often feels less like a spoof and more like a straight Trek story. That doesn’t mean it lacks gags, but it’s not as comedic as usual. It’s decent but not much better than that. For my thoughts on this two-part episode, look at my discussion of the second segment. Expect more Star Wars references here, though “Quasi-Norms” bears more of a debt to the Flash Gordon/Buck Rogers style of sci-fi. The multiple subplots on display here make the episodes rather disjointed and scattershot at times, but it still works fairly well. The broader focus also gives the shows a more epic scope that suits it. The series comes to an end with an obvious 2001: A Space Odyssey parody. Oddly, the episode often takes on a more dramatic tone and it eschews the comedy. This leaves it a bit spotty, as it doesn’t hit the target particularly well. It’s interesting at times but not special. 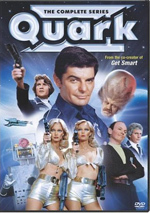 Quark appears in an aspect ratio of 1.33:1 on this single-sided, double-layered DVD; due to those dimensions, the image has not been enhanced for 16X9 televisions. I didn’t expect much from these shows, but they actually looked pretty good given their age. Sharpness was usually satisfying. A little softness interfered with some shots, a factor exacerbated by some moderate grain; that element made matters a little murky at times. Nonetheless, the shows demonstrated positive delineation most of the time. No issues with jagged edges or shimmering occurred, and I detected no signs of edge enhancement. Source flaws remained minor. In addition to the grain, I saw occasional specks and marks, but these were fairly insubstantial and much less noticeable than I expected. 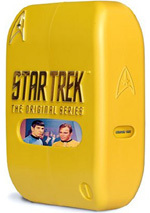 Quark went with a broad Trek “Original Series”-style palette. As was the case with “The Original Series”, the tones could look a bit heavy, but they usually seemed good. The tones tended to seem lively and full. Blacks also appeared deep and rich, while shadows demonstrated good clarity and definition. The image was tentative enough to fall down to a “B-“, but I felt pleased nonetheless. As for the monaural audio of Quark, it seemed perfectly decent for a 30-year-old TV series. Speech was a little reedy, but the lines remained reasonably concise and natural, and only a little edginess interfered. Music was similarly mediocre. The score showed minor range but usually appeared somewhat thin and didn’t excel in any way. Effects demonstrated acceptable definition and no better; those elements came across as clear enough but don’t expect much. That concept was true for all aspects of this mix, as the audio was fine for its age and not superior to that. In addition, we find two Minisodes. These show snippets from the “Anybody Here Seen Jeannie?” episode of I Dream of Jeannie (4:48) and the “Island of Horrors” episode of Fantasy Island (5:05). These are essentially Reader’s Digest versions of specific shows. They just touch on plot “highlights” of the programs, so we zip through the episodes in a brief period. That makes them vaguely tolerable, though both are pretty useless. Finally, the disc provides some Previews. We get promos for You Don’t Mess With the Zohan, So I Married an Axe Murderer and My Mom’s New Boyfriend. The post-Star Wars sci-fi universe gets spoofing via Quark. The series didn’t last very long, and it never quite found its groove. We find a mix of pretty good shows and fairly lame ones here, so don’t expect consistency. The DVD offers acceptably positive picture and audio but it comes with no substantial supplements. While Quark doesn’t do a lot for me, genre fans should get a kick out of it.